cabbage with dill, oil, and vinegar. Add salt and pepper to taste. salad. 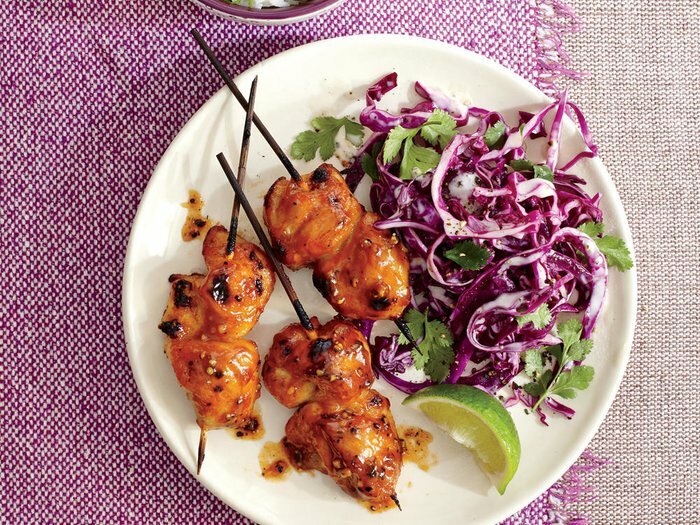 Serve with freshly grilled chicken kebab. spices, olive oil, garlic, and salt. Roll the chicken in the mixture. frying pan, for about five minutes. finely chop the chili. Mix together all of the ingredients. cold water. Cut the noodles into smaller pieces with kitchen scissors. 3. Cut the mango into cubes and thinly slice the pea pods and the onions. 4. Cut the salmon into cubes. Fry them quickly in a frying pan with butter. salmon cubes over the noodle salad.